We often think of the internet as a levelling, democratising technology – one that extends access to knowledge, education, cultural resources and markets. But the net also reflects the social and economic divides we find offline. Released this week, the second report of the Australian Digital Inclusion Index (ADII) reports on data covering four years of local online participation across three dimensions: online access, digital ability and affordability. Together, the three dimensions produce a digital inclusion score. Since 2014, when data was first collected, Australia's overall digital inclusion score has improved by 3.8 points, from 52.7 to 56.5. In 2016–2017 alone, Australia's score rose by 2.0 points, from 54.5 to 56.5. But there is still a "digital divide" between richer and poorer Australians. In 2017, people in our lowest income households (less than A$35,000 per year) have a digital inclusion score of 41.1, which is 27 points lower than those in the highest income households (above A$150,000) at 68.1. When the three dimensions are considered separately, the measures of access and digital ability show consistent improvement from 2014 to 2017. However, the affordability measure has registered a decline since the 2014 national baseline (despite a slight bump in the past 12 months). Affordability is a key dimension of digital inclusion. Internet connectivity is important for accessing a wide range of education, government, health and business services. A decline in internet affordability means Australians on fixed or low incomes risk missing out on the benefits of digital technologies, and falling further behind more connected Australians. The ADII shows that the cost of data—for both fixed and mobile internet—has declined over 2014-2017. These findings are in line with the ACCC's ongoing monitoring of prices for telecommunications services, which indicate an average decline in real terms of 3.1% since 2006. However, when we measure affordability, we are not only looking at the cost of data; we are also interested in what proportion of household income is being dedicated to this service. The affordability problem with the internet is different from other key household services where there are price pressures, such as electricity and water. The residential consumption of energy has grown very slowly over the last decade, but prices have increased sharply. With the internet, while we are now getting more data for our dollar, our demand for data has dramatically increased. A recent report from the Commonwealth Bureau of Communications and Arts Research (BCAR) tracks the affordability of phone and internet use since 2006. 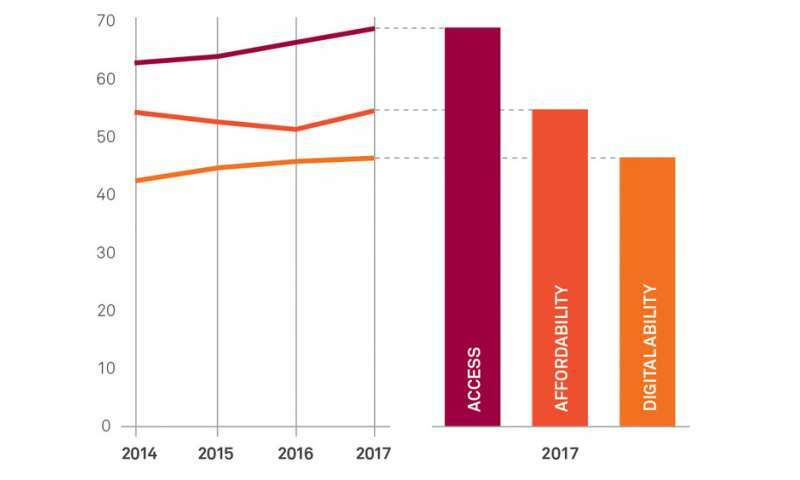 The BCAR report finds that, overall, phone and internet affordability has improved since 2006. However, their data also shows that almost all the gains occurred before 2013, and that, since then, affordability has declined or flat-lined. Further, BCAR's data suggests that the lowest income households in Australia are now spending almost 10% of their incomes on internet and communications services. In contrast, middle income households are spending around 4% of their disposable income on these services, and for wealthier households, the figure is less than 2%. Some recent and far-reaching changes in our use of technology are evident here: the extent to which the internet has become an integral part of everyday life, the fact that we are spending more time online, and we are doing an increasing range of activities online. In many households, we are also connecting with more devices. However, the problem of affordability also reflects another recent development that the ADII highlights: one-in-five Australians now only accesses the internet through a mobile device—and we know that mobile data is considerably more expensive than fixed broadband on a per gigabyte basis. Mobile-only use is correlated with a range of socioeconomic factors. The ADII data shows that people in low income households, those who are not employed, and those with low levels of education, are all more likely to be mobile-only. Despite the benefits of mobile internet, this group is characterised by a relatively high degree of digital exclusion. In 2017, mobile-only users have an overall ADII score of 42.3, 14.2 points below the national average (56.5). 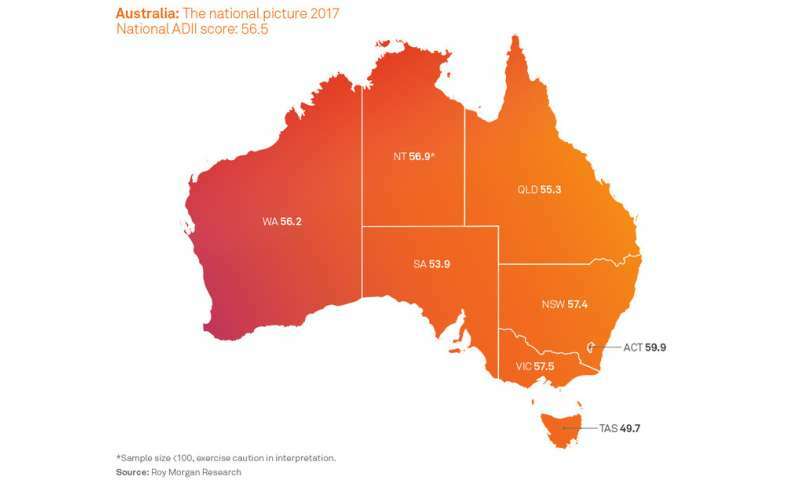 In the 2017 report, the ACT, followed by Victoria and New South Wales, are the highest scoring states in the overall digital inclusion score, as they were in 2016. Tasmania remains the lowest scoring, followed by South Australia. The lowest scoring socio-demographic groups in 2017 were households earning less than A$35,000 per year (overall score of 41.1), Australians aged over 65 (overall score of 42.9) and those with a disability (overall score of 47.0). The ADII uses data derived from Roy Morgan Research's ongoing, weekly Single Source survey of 50,000 Australians. These are extensive, face-to-face interviews, dealing with information and technology, internet services, attitudes, and demographics. Calculations for the ADII are based on a sub-sample of 16,000 responses in each 12 month period. The index is a score out of 100: the higher the overall score, the higher the level of digital inclusion. An ADII score of 100 represents a hypothetically perfect level of access, affordability, and digital ability. A score of 65 or over is regarded as high; one below 45 as low. An increasing number of Australians are online, but although the costs of data and devices are falling, there is a risk that issues of affordability will leave some of our most vulnerable behind. Australians with low levels of income, education and employment are consistently less connected than the rest of the population, with consequences that will become increasingly serious as the digital transformation of government and the economy proceeds. As an increasing number of essential services and communications move online, the challenge to make the Australian internet more inclusive is becoming more urgent. Affordability is a key area for attention, but so is improving Australians' digital ability. The issue of affordability suggests a range of possible areas for useful policy intervention. If we think it important to subsidise essential utilities such as electricity for low-income Australians, we may need to consider whether an allowance for internet access for essential services might also be necessary. For the large number of lower-income Australians who rely entirely on mobile devices for internet connections, we will also need to consider new ways to support digital inclusion. These could include unmetered access to essential health and social services, and the further development of secure, public access wi-fi.